Mapantsula tells the story of Panic, a petty gangster who inevitably becomes caught up in the growing anti-apartheid struggle and has to choose between individual gain and a united stand against the system. Lee. "Mapantstula Review." IMDb. IMDb.com, n.d. Web. 17 Apr. 2014. 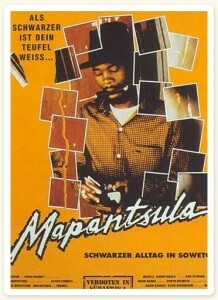 "Mapantsula." London. N.p., n.d. Web. 17 Apr. 2014. Davies, Matt. “Mapantsula and the Culture of Resistance in South Africa.” Africa Today, vol. 37, no. 1, 1990, pp. 97–99. JSTOR, JSTOR, www.jstor.org/stable/4186642.